Gears with an asymmetric involute gear tooth form were analyzed to determine their bending and contact stresses relative to symmetric involute gear tooth designs, which are representative of helicopter main-drive gears. Hypoid gears are the paragon of gearing. To establish line contact between the pitches in hypoid gears, the kinematically correct pitch surfaces have to be determined based on the axoids. In cylindrical and bevel gears, the axoids are identical to the pitch surfaces and their diameter or cone angle can be calculated simply by using the knowledge about number of teeth and module or ratio and shaft angle. In hypoid gears, a rather complex approach is required to find the location of the teeth—even before any information about flank form can be considered. This article is part seven of an eight-part series on the tribology aspects of angular gear drives. The complete Product News section from the June/July 2011 issue of Gear Technology. The complete Technical Calendar from the June/July 2011 issue of Gear Technology. 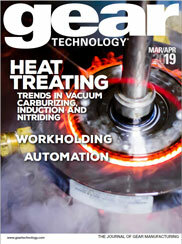 The complete Industry News section from the June/July 2011 issue of Gear Technology. Relic of an era when quality was an afterthought.